This morning my friend Chelsea left a bag of tomatoes in the kitchen at work. 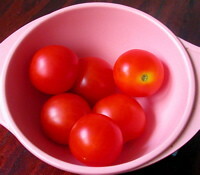 It seems she has more tomato plant than she can handle so she gives the extras away. I snatched up six cherry tomatoes and decided to use them for pizza tonight. Generally we have pizza night when we have lots of leftover ingredients from other meals so no two pizzas are ever the same. Last nights pizza was extraordinary because we have been buying a lot of veggies lately in an attempt to eat healthier. In fact, we had so many great ingredients on hand we left off the olive, onions, and garlic that are usually pizza staples in our house. Preheat the oven to 450 degrees Fahrenheit. If you are making a crust from scratch, precook the crush according to the instructions. Spread the artichoke topping evenly across the top of the crust. 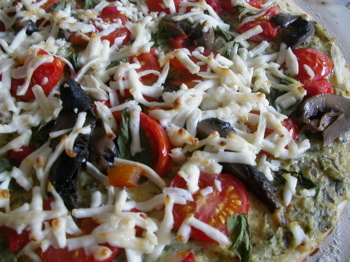 Add your favorite toppings (or whatever you have on hand) and cover with the vegan mozzarella. Cook for 10 minutes, Serves 2-4 depending on the size of your crust. *Harris Teeter artichoke topping is only available at Harris Teeter stores. If you do not have a Harris Teeter in your area you can make this topping by pureeing artichoke hearts with some olive oil and fresh parsley in your blender. yum - looks amazing! i've just come back from the local orgaic farmer's market where i picked up some gorgeous oyster mushrooms and now i need to decide what to do with 'em. have you ever tried making pizza using a base of pureed winter squash? i'm also into olive tapenade on pizza these days. tune in to my blog tomorrow for a vegan mexican-inspired dinner! YUMMMM! Oh god, seeing that picture really made me miss all that yummy Pacific Northwest pizza, but it also reminded me that I can do it myself. Oh, I should send you pictures soon or put them on my blog. I actually did the whole kodak gallery thing, but that might be too much trip for you. MMMM.